To Use Next Year. . . . Okay, this is a "day late and a dollar" short. Or you could call it reactive teaching. Regardless of what I call it I hope I remember to do it next October. So, it was last Thursday, Halloween, and my first graders show up. Have I mentioned that I have my first graders the VERY last 45 minutes of the day? Have I told you that I dismiss them from music? Have I told you just how much fun this is? (Insert sarcasm). Sadly, I'm the one that did the master schedule. If you've ever done a master schedule you know that there are a million variables that contribute into making it. Well, lesson learned: regardless of the variables do not have first grade or kinder last. Sorry, to get back to Halloween day. My first graders show up with all their stuff, including their lovely Halloween Rings that their teacher JUST handed them. Thanks. Well, when life hands you lemons you. . . .try to make lemonade. So, after "Pumpkin, Pumpkin", our opener/mixer, I quickly grabbed my beat strips and put the kids into groups of four. Lucky me that the rings were "bats" and "spiders". Hmmm. . . "bats" and "spi-ders". We're working on ta & ti-ti prep. (2/5 of my first graders came in with NO music experience so it's been a QUICK teaching/review of comparatives). 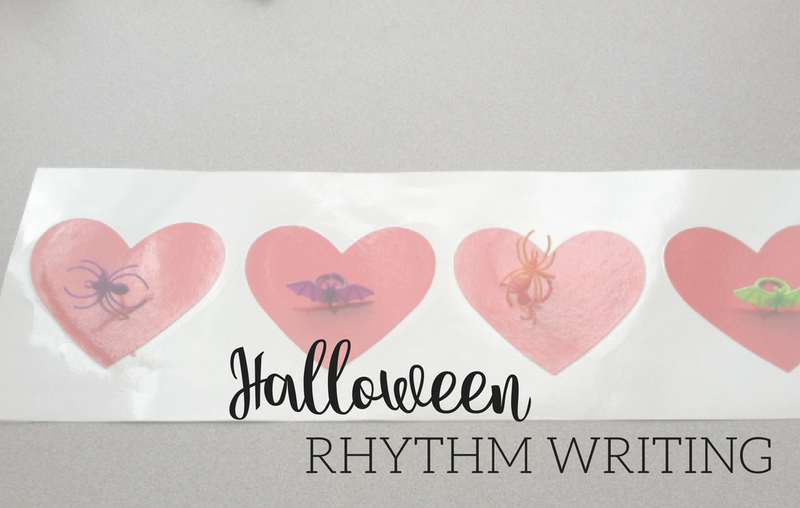 At any rate, in their groups of four they had to put their rings on the beat chart and say their pattern using "bat" and "spider". After that they had to change the "bat" to long and the "spi-der" to "short-short"
"bat, bat, spi-der bat" which then became "long, long, short-short, long." 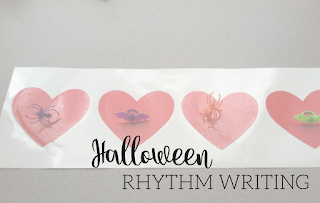 After they composed with that group they had 7 seconds to move to a different beat chart (these were placed around the room. The only rule being that there could only be four people at a chart and it was "first come, first serve". After a few rotations we moved to their seats on the risers and used the rings to, as a group, compose a pattern that became an ostinato for "Halloween, Halloween." I just posted some new Thanksgiving Files called "Free the Birds" that reinforce and practice various melodic elements. (And yes, the title is a shameless play on the title of the new Thanksgiving family movie coming out that my two and I have been DYING to see since we saw the preview this summer!) 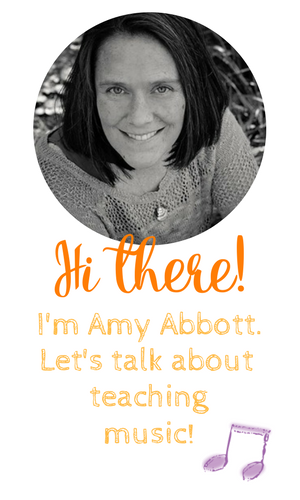 I'll blog about that later, but you can check them out on my Teachers Pay Teachers store. I love love love the beat strips. I can imagine making them with all different images for all different sorts of occasions. Any tips for that? I feel like it's as easy as printing on cardstock and laminating. I've also done the thing where you put down cute/colored post its on cardstock and laminating that. I feel like it saves my printer ink anyway. Thoughts about what's worked well for you? Legal size or something different for smaller grades? I've got old counter dots and blocks and other sorts of manipulative things. I'd love to get your input as I start to create more of this sort of thing. You rock! Love your posts! I was thinking of this blog post when I was at the Dollar Tree (LOVE that store!) and I found the cutest little plastic party favors very similar to these rings! I immediately thought of this lesson idea! The party favors had little frogs, snakes, lizards, turtles and spiders. They also had alligators, but I'm putting those aside for a tika tika prep. :) Thanks for the inspiration! I was thinking of this blog post when I was at the Dollar Tree (LOVE that store!) and I found the cutest little plastic animals in the party favor aisle! They had packages of snakes, frogs, turtles, spiders and lizards. It also included alligators but I put those aside for a tika tika prep lesson for older grade levels. Amy, what size of paper do you print these on?